The 2014–15 Top 14 competition was a French domestic rugby union club competition operated by the Ligue Nationale de Rugby (LNR). Two new teams from the 2013–14 Pro D2 season were promoted to Top 14 this season, Lyon and La Rochelle in place of the two relegated teams, Perpignan and Biarritz Olympique. Home-and-away play began on 16 August 2014 and ended on 23 May 2015. This was followed by a playoff stage involving the top six teams, culminating in the final on 13 June 2015. The top six teams at the end of the regular season (after all the teams played one another twice, once at home, once away) enter a knockout stage to decide the Champions of France. This consists of three rounds: the teams finishing third to sixth in the table play quarter-finals (hosted by the third and fourth placed teams). The winners then face the top two teams in the semi-finals, with the winners meeting in the final at Stade de France. The LNR uses a slightly different bonus points system from that used in most other rugby competitions. It trialled a new system in 2007–08 explicitly designed to prevent a losing team from earning more than one bonus point in a match, a system that also made it impossible for either team to earn a bonus point in a drawn match. LNR chose to continue with this system for subsequent seasons. 1 bonus point for winning while scoring at least 3 more tries than the opponent. This replaces the standard bonus point for scoring 4 tries regardless of the match result. 1 bonus point for losing by 5 points (or less). This is a change from previous seasons, in which the margin was 7 points or less. Green background (rows 1 and 2) receive semi-final play-off places and receive berths in the 2015–16 European Rugby Champions Cup. Blue background (rows 3 to 6) receive quarter-final play-off places, and receive berths in the Champions Cup. Yellow background (row 7) indicates the team that advances to a play-off against the winner of the Aviva Premiership vs Pro12 play-off, or 2014–15 European Rugby Challenge Cup winner if they have not already qualified for the Champions Cup. Plain background indicates teams that earn a place in the European Rugby Challenge Cup. Red background (row 13 and 14) will be relegated to Rugby Pro D2. Normally, the teams that finish in 13th and 14th places in the table are relegated to Pro D2 at the end of the season. In certain circumstances, "financial reasons" may cause a higher placed team to be demoted instead. This last happened at the end of the 2009–10 season when 12th place Montauban were relegated thereby reprieving 13th place Bayonne. The outline fixtures schedule was announced on 16 May 2014. Detailed fixtures information evolved as the season progressed (i.e. specific kick off times). All times are in Central European Summer Time (UTC+2). Note: Flags to the left of player names indicate national team as has been defined under World Rugby eligibility rules, or primary nationality for players who have not yet earned international senior caps. Players may hold one or more non-WR nationalities. Attendances do not include the semi-finals or final as these are at neutral venues. ^ Bayonne took one match across the Spanish border to Estadio Anoeta in Donostia-San Sebastián in 2012–13 and in 2013–14. 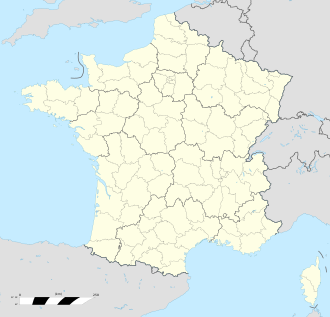 ^ Bordeaux Bègles has made the larger Stade Chaban-Delmas their primary home since 2013–14 at the expense of their traditional home of Stade André-Moga. ^ Castres took one home match to Stade de la Méditerranée in Béziers. ^ In 2013–14, Grenoble played six home matches at the city's largest venue, Stade des Alpes, from 2014 onwards Grenoble became the primary tenant at the venue and hosted nearly all of its home games there. ^ Following the season, Racing Métro dropped "Métro" from its name, becoming simply Racing 92. ^ Racing took one home match to Stade Océane in Le Havre. ^ In the past, Stade Français has taken occasional home matches to Stade de France, but did not do so in 2014–15. ^ So far in 2014–15, Toulon has taken one home match to Allianz Riviera in Nice and one to Stade Vélodrome in Marseille. ^ Toulon's ground capacity is up to 15,400 from 15,250 the previous season. ^ Toulouse often take high-demand home matches to the city's largest sporting venue, Stadium Municipal. However, they did not do so in either 2013–14 or 2014–15, as it was undergoing renovation for UEFA Euro 2016. ^ Stade Francais's attendance figure includes home quarter-final. ^ Toulouse's attendance figure includes home quarter-final. ^ "Statistiques générales, Saison 2014-2015" (in French). Ligue nationale de rugby. Archived from the original on 2013-08-06. Retrieved 21 May 2015. Click on the tabs for "Joueurs" and "Meilleurs réalisateurs". ^ "Statistiques générales, Saison 2014-2015" (in French). Ligue nationale de rugby. Archived from the original on 2013-08-06. Retrieved 21 May 2015. Click on the tabs for "Joueurs" and "Meilleurs marqueurs". ^ a b c "Calendrier 2014/2015" (PDF) (in French). LNR. 16 May 2014. Retrieved 2 June 2014. ^ a b "CP LNR - TOP 14 et PRO D2, les calendriers 2014-2015" (in French). LNR. 16 May 2014. Retrieved 2 June 2014. ^ "French try out new bonus point system". Planet-Rugby.com. 27 June 2007. Archived from the original on 29 September 2007. Retrieved 13 August 2007. ^ "Article 330, Section 3.2. Points "terrain"" (PDF). Règlements de la Ligue Nationale de Rugby 2008/2009, Chapitre 2 : Règlement sportif du Championnat de France Professionnel (in French). LNR. Archived from the original (PDF) on 17 February 2012. Retrieved 27 August 2008. ^ "Article 330, Section 3.2. Points "terrain" et points de bonus" (PDF). Statuts et Reglements de la Ligue Nationale de Rugby 2014/2015, Chapitre 2 : Règlement sportif des championnats profesionnels (in French). Ligue Nationale de Rugby. p. 166. Retrieved 2014-08-26. ^ "Future of European Rugby resolved" (Press release). RFU. 10 April 2014. Archived from the original on 2014-05-25. Retrieved 11 June 2014. ^ "TOP 14, le calendrier des oppositions" (in French). LNR. Retrieved 8 August 2014. ^ Rugby, Ligue Nationale de. "15/08/14 - Bayonne - Toulon". lnr.fr. Retrieved 14 September 2017. ^ Rugby, Ligue Nationale de. "16/08/14 - Clermont - Grenoble". lnr.fr. Retrieved 14 September 2017. ^ Rugby, Ligue Nationale de. "16/08/14 - Bordeaux-Bègles - Lyon". lnr.fr. Retrieved 14 September 2017. ^ Rugby, Ligue Nationale de. "16/08/14 - Brive - La Rochelle". lnr.fr. Retrieved 14 September 2017. ^ Rugby, Ligue Nationale de. "16/08/14 - Castres - Paris". lnr.fr. Retrieved 14 September 2017. ^ Rugby, Ligue Nationale de. "16/08/14 - Toulouse - Oyonnax". lnr.fr. Retrieved 14 September 2017. ^ Rugby, Ligue Nationale de. "16/08/14 - Montpellier - Racing 92". lnr.fr. Retrieved 14 September 2017. ^ Rugby, Ligue Nationale de. "22/08/14 - Toulouse - Castres". lnr.fr. Retrieved 14 September 2017. ^ Rugby, Ligue Nationale de. "23/08/14 - Brive - Clermont". lnr.fr. Retrieved 14 September 2017. ^ Rugby, Ligue Nationale de. "23/08/14 - Bayonne - Oyonnax". lnr.fr. Retrieved 14 September 2017. ^ Rugby, Ligue Nationale de. "23/08/14 - Bordeaux-Bègles - Racing 92". lnr.fr. Retrieved 14 September 2017. ^ Rugby, Ligue Nationale de. "23/08/14 - Montpellier - Grenoble". lnr.fr. Retrieved 14 September 2017. ^ Rugby, Ligue Nationale de. "23/08/14 - Toulon - La Rochelle". lnr.fr. Retrieved 14 September 2017. ^ Rugby, Ligue Nationale de. "23/08/14 - Paris - Lyon". lnr.fr. Retrieved 14 September 2017. ^ Rugby, Ligue Nationale de. "29/08/14 - Clermont - Montpellier". lnr.fr. Retrieved 14 September 2017. ^ Rugby, Ligue Nationale de. "30/08/14 - La Rochelle - Toulouse". lnr.fr. Retrieved 14 September 2017. ^ Rugby, Ligue Nationale de. "30/08/14 - Castres - Bayonne". lnr.fr. Retrieved 14 September 2017. ^ Rugby, Ligue Nationale de. "30/08/14 - Grenoble - Bordeaux-Bègles". lnr.fr. Retrieved 14 September 2017. ^ Rugby, Ligue Nationale de. "30/08/14 - Lyon - Brive". lnr.fr. Retrieved 14 September 2017. ^ Rugby, Ligue Nationale de. "30/08/14 - Oyonnax - Paris". lnr.fr. Retrieved 14 September 2017. ^ Rugby, Ligue Nationale de. "30/08/14 - Racing 92 - Toulon". lnr.fr. Retrieved 14 September 2017. ^ Rugby, Ligue Nationale de. "05/09/14 - Montpellier - Castres". lnr.fr. Retrieved 14 September 2017. ^ Rugby, Ligue Nationale de. "06/09/14 - Brive - Toulouse". lnr.fr. Retrieved 14 September 2017. ^ Rugby, Ligue Nationale de. "06/09/14 - Clermont - Racing 92". lnr.fr. Retrieved 14 September 2017. ^ Rugby, Ligue Nationale de. "06/09/14 - Grenoble - La Rochelle". lnr.fr. Retrieved 14 September 2017. ^ Rugby, Ligue Nationale de. "06/09/14 - Lyon - Oyonnax". lnr.fr. Retrieved 14 September 2017. ^ Rugby, Ligue Nationale de. "06/09/14 - Paris - Bayonne". lnr.fr. Retrieved 14 September 2017. ^ Rugby, Ligue Nationale de. "06/09/14 - Toulon - Bordeaux-Bègles". lnr.fr. Retrieved 14 September 2017. ^ Rugby, Ligue Nationale de. "Ligue Nationale de Rugby - Ligue Nationale de Rugby". www.lnr.fr. Retrieved 14 September 2017. ^ a b Rugby, Ligue Nationale de. "Ligue Nationale de Rugby - Ligue Nationale de Rugby". www.lnr.fr. Retrieved 14 September 2017. ^ Rugby, Ligue Nationale de. "10/04/15 - La Rochelle - Paris". lnr.fr. Retrieved 14 September 2017. ^ Rugby, Ligue Nationale de. "11/04/15 - Racing 92 - Montpellier". lnr.fr. Retrieved 14 September 2017. ^ Rugby, Ligue Nationale de. "11/04/15 - Brive - Lyon". lnr.fr. Retrieved 14 September 2017. ^ Rugby, Ligue Nationale de. "11/04/15 - Clermont - Oyonnax". lnr.fr. Retrieved 14 September 2017. ^ Rugby, Ligue Nationale de. "11/04/15 - Toulouse - Bayonne". lnr.fr. Retrieved 14 September 2017. ^ Rugby, Ligue Nationale de. "11/04/15 - Grenoble - Toulon". lnr.fr. Retrieved 14 September 2017. ^ Rugby, Ligue Nationale de. "11/04/15 - Castres - Bordeaux-Bègles". lnr.fr. Retrieved 14 September 2017. ^ Rugby, Ligue Nationale de. "24/04/15 - Paris - Toulouse". lnr.fr. Retrieved 14 September 2017. ^ Rugby, Ligue Nationale de. "25/04/15 - La Rochelle - Toulon". lnr.fr. Retrieved 14 September 2017. ^ Rugby, Ligue Nationale de. "25/04/15 - Bayonne - Grenoble". lnr.fr. Retrieved 14 September 2017. ^ Rugby, Ligue Nationale de. "25/04/15 - Brive - Montpellier". lnr.fr. Retrieved 14 September 2017. ^ Rugby, Ligue Nationale de. "25/04/15 - Lyon - Bordeaux-Bègles". lnr.fr. Retrieved 14 September 2017. ^ Rugby, Ligue Nationale de. "25/04/15 - Oyonnax - Racing 92". lnr.fr. Retrieved 14 September 2017. ^ Rugby, Ligue Nationale de. "25/04/15 - Castres - Clermont". lnr.fr. Retrieved 14 September 2017. ^ Rugby, Ligue Nationale de. "09/05/15 - Toulon - Castres". lnr.fr. Retrieved 14 September 2017. ^ Rugby, Ligue Nationale de. "09/05/15 - Bordeaux-Bègles - Oyonnax". lnr.fr. Retrieved 14 September 2017. ^ Rugby, Ligue Nationale de. "09/05/15 - Lyon - La Rochelle". lnr.fr. Retrieved 14 September 2017. ^ Rugby, Ligue Nationale de. "09/05/15 - Montpellier - Bayonne". lnr.fr. Retrieved 14 September 2017. ^ Rugby, Ligue Nationale de. "09/05/15 - Toulouse - Brive". lnr.fr. Retrieved 14 September 2017. ^ Rugby, Ligue Nationale de. "09/05/15 - Grenoble - Clermont". lnr.fr. Retrieved 14 September 2017. ^ Rugby, Ligue Nationale de. "10/05/15 - Racing 92 - Paris". lnr.fr. Retrieved 14 September 2017. ^ Rugby, Ligue Nationale de. "15/05/15 - Oyonnax - Lyon". lnr.fr. Retrieved 14 September 2017. ^ Rugby, Ligue Nationale de. "16/05/15 - Grenoble - Toulouse". lnr.fr. Retrieved 14 September 2017. ^ Rugby, Ligue Nationale de. "16/05/15 - Bordeaux-Bègles - Bayonne". lnr.fr. Retrieved 14 September 2017. ^ Rugby, Ligue Nationale de. "16/05/15 - Castres - Brive". lnr.fr. Retrieved 14 September 2017. ^ Rugby, Ligue Nationale de. "16/05/15 - La Rochelle - Racing 92". lnr.fr. Retrieved 14 September 2017. ^ Rugby, Ligue Nationale de. "16/05/15 - Paris - Montpellier". lnr.fr. Retrieved 14 September 2017. ^ Rugby, Ligue Nationale de. "17/05/15 - Clermont - Toulon". lnr.fr. Retrieved 14 September 2017. ^ Rugby, Ligue Nationale de. "23/05/15 - Bayonne - La Rochelle". lnr.fr. Retrieved 14 September 2017. ^ Rugby, Ligue Nationale de. "23/05/15 - Brive - Paris". lnr.fr. Retrieved 14 September 2017. ^ Rugby, Ligue Nationale de. "23/05/15 - Lyon - Grenoble". lnr.fr. Retrieved 14 September 2017. ^ Rugby, Ligue Nationale de. "23/05/15 - Montpellier - Clermont". lnr.fr. Retrieved 14 September 2017. ^ Rugby, Ligue Nationale de. "23/05/15 - Toulon - Oyonnax". lnr.fr. Retrieved 14 September 2017. ^ Rugby, Ligue Nationale de. "23/05/15 - Toulouse - Bordeaux-Bègles". lnr.fr. Retrieved 14 September 2017. ^ Rugby, Ligue Nationale de. "30/05/15 - Toulouse - Oyonnax". lnr.fr. Retrieved 14 September 2017. ^ Rugby, Ligue Nationale de. "05/06/15 - Toulon - Paris". lnr.fr. Retrieved 14 September 2017. ^ a b "TOP 14, les demi-finales 2015 à Bordeaux" (Press release) (in French). Ligue nationale de rugby. 1 December 2014. Retrieved 3 December 2014. ^ Rugby, Ligue Nationale de. "06/06/15 - Clermont - Toulouse". lnr.fr. Retrieved 14 September 2017. This page was last edited on 13 November 2018, at 17:37 (UTC).